This is an old hand woven carpet in great quality. The whitish areas shown in some photos are reflections of light on the silk. 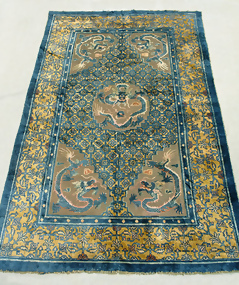 The five claws dragons are woven on a brown metal background (gilt copper). The gilt is almost completely vanished from the front side but remains are more visible on the reverse side; when gilt was applied using the old method (use of mercury), it did not stay as well. The copper, which was a precious metal at the time, was stretched, cut up and twisted around the silk threads with wooden rollers. The additional photos (will be added shortly) should show that many metal threads were bundled together when it was woven. In today's standards, it is difficult to imagine the work that was involved when this carpet was created. We can only imagine now that this metallic area was once shining in soft gold, probably reflecting the area dyed in yellow/gold. The colors on this carpet are white, yellow/gold, red/brown and different shades of blue. There are no Peking knots as it may appear in some photos. The heads were all cut in the same length. The white line in the center (will be shown in an additional photo) indicates that the carpet was probably kept folded for a lengthy time and caused the damage on the yellow silk (additional photo). There are some repairs in the metal area and red dye stains on a pair of dragons. The repairs were done very well professionally and it shows little trace of them in the front. Loose ends particularly on the top and bottom ends. Detailed photos will be added shortly in item #748703.